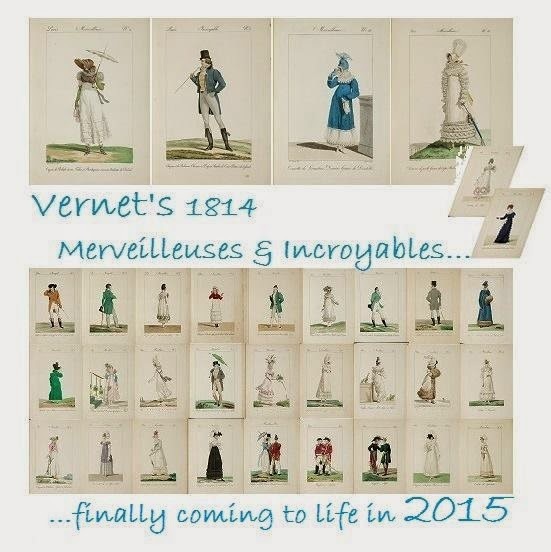 Would you like to take a journey this year back to 1811? Yes? Well, what if you could fly from Weimar, Germany, off to Paris and then to London each month, and find out what colors and baubles fashionable people were sporting? What if you traveled with four friendly guides, happy to unravel with you the mystery of the Spanish hat, or why bugle beads were so last month, and able to translate for you if you didn't speak the language? Really, we've got your ear? You're interested? 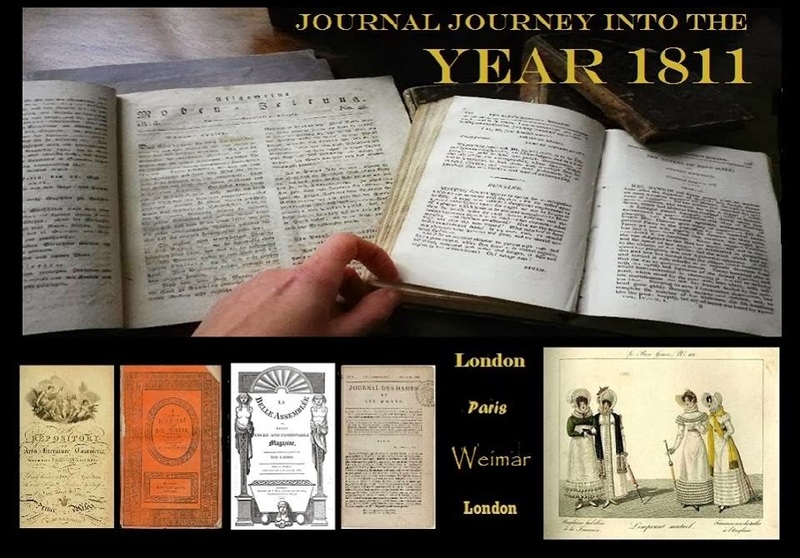 Then come with us a Journal Journey into the Year 1811. Each month Sabine, Alessandra, Maggie, and I will spirit you away into the fashion pages of four well-known journals of the day: Journal des Dames et des Modes, Ackermann's Repository of Arts, Literature, Commerce, Manufactures, Fashions, and Politics, La Belle Assemblée or Bell's Court Magazine, and Journal des Luxus und der Moden. As any fashion guide will -- must, really, since after all we can't help ourselves-- we'll comment on what we read, speculate on the meaning of terms, highlight trends and little pretties we think especially interesting, and we'll whisper our translations from German and French straight into your ears. We hope you'll want to talk with us, too, making our journey that more enjoyable. So, find a comfy seat, curl up, and let's start! This month we have three articles over two pages, nos. 44 and 45. You might wish to know that Her Royal Highness Princess Amelia had lately passed away, and the gentle society was in mourning for some weeks more. Therefore, like the stripped trees and frost-bleached grasses out of doors, and the snowflakes in the air, the Court, and those connected with it, were clad in black, and grey, but also in scarlet. Everyone was dressed as warmly as Dame Fashion allowed, which to my mind, wasn't warmly enough. Another point you'll want to mark is that this magazine reports on the fashions for the next month, not the current one. So these are fashions for February, though this is the January issue. Full text of fashion pages. 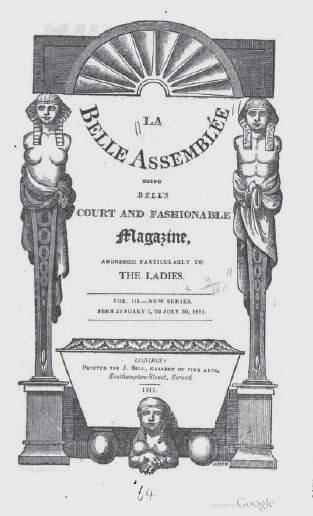 Transcribed from La Belle Assemblée; Being Bell's Court and Fashionable Magazine journal, accessed through Google Books. 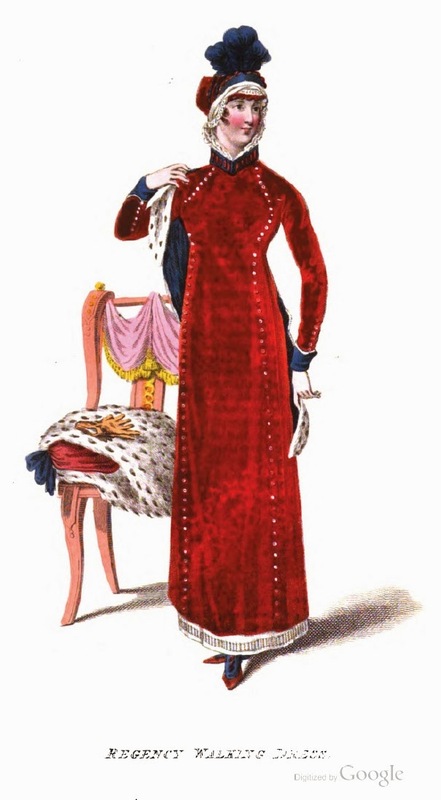 A pelisse of scarlet Merino cloth (1), buttoned down the front and up the arm with small gold buttons; the collar and cuffs of purple velvet; but during the mourning (2), of black, striped with scarlet; an ermine tippet pointed in the back (3) and muffs of the same. A bonnet of scarlet cloth (4), turned up with velvet, and formed to come over the face; the veil passed through the front and brought round the neck. Boots of scarlet cloth (5) trimmed with velvet. A round dress of white satin, sloped up in the front (6); with small train ornamented round the bottom with velvet in a scroll pattern (7), vandyked at the edges, and dotted with black chenille (8); the velvet during the mourning should be grey or scarlet; the bosom, girdle (9), and sleeves of this dress are ornamented to correspond, in the form exhibited in the plate. A turban cap (10) of white satin; looped with pearls, and edged with velvet; the hair combed full over the face, curled in thick flat curls (11), divided on the forehead. Necklace, earrings, and bracelets of gold and pearls blended (12). White kid (13) shoes and gloves; fan of white crape (14) and gold. (1) "Cloth" in English terminology normally meant specifically wool cloth. (2) This plate and its description include more colors in it than prescribed by mourning. That's why there's the notation that during the mourning period, the color would be replaced by black. This outfit then could be made up and worn after mourning was over. At first I puzzled over this, wondering if the plate had been decided upon before Princess Amelia had died, and all the text changed to reflect the situation, but since the entire fashion section is devoted to dealing with fashion during mourning, decided this was not an afterthought. It makes one wonder how the writing and publication process worked. How far in advance, and how much room for change? It also raises the question of where these fashions come from. Other magazines, such as Luxus und der Moden, and the eighteenth century Galerie des Modes and The Gallery of Fashion, purport to report on fashions they actually see. Does this one, too? (3) "Ermine tippet pointed in the back": so far as I can tell, construction would be two long pieced sections of ermine, sewn in the center back in a vee shape so that the tippet would like flat in a vee at the back of the neck. Unclear whether the tippet was tubular or single-faced and backed with something like silk. (4) "bonnet of scarlet cloth": scarlet wool. This would not have been felt, would it, because if so would that not have been specified? Could the bonnet cloth have been treated with a stiffener to help it hold its shape? (5) "Boots of scarlet cloth trimmed with velvet": wool cloth boots, not leather. Not terribly weather proof. Indoor or good weather wear only? Every Lady Her Own Shoemaker (of a later period) says that shoes could last a matter of weeks or months. At that time fabric shoes were common, so perhaps these boots were not meant to have a long life. (6) "round dress of white satin, sloped up in the front". Interesting construction notation that needs investigation. (7) "ornamented with velvet in a scroll pattern": this must have been a very bold appliqued trim. (8) "dotted with black chenille": it may be that the satin is woven with chenille such that it forms dots on the right side. These would appear in some relief. However, it may be that it was cut into tiny lengths and couched down with matching silk thread. The term chenille means caterpiller in French, a reference to the fuzzy look and feel of the thread. It was made of a silk core thread twisted with thousands of tiny silk threads into the fuzzy result they knew then and we know today. De St. Aubin, author of The Art of the Embroiderer (part of Diderot's Encyclopedia), which came out in the latter half of the 18th century, says that it was usually couched down with matching threads and that it was a delicate embroidery, easily spoiled. It could also be pulled through fabric, such as with tambour stitch, but this tends to loosen the fuzzy threads so that they fall out, so that's less common. I worked with 100% silk chenille embroidery on tightly woven silk chantung, couched with fine spun silk thread, and report that couching is simple but that yes, it's delicate and pulls out easily. I have found examples of chenille work in the early 19th century, but it fell out of favor in women's dress. (9) "girdle". Another interesting term that needs investigation. The bottom of the bodice is embroidered but it is unclear if it is actually a separate piece, a waistband, or just embroidery. (10) "turban cap": notice the phrase includes the word "cap". Does this mean that the turban was not wound on from a length of fabric, as it would have been in the 1790s, but pre-constructed? Most assuredly yes. (11) "flat curls": so therefore, very shaped, set, and unnatural, not springy natural coils. (12) "gold and pearls blended": it would be nice to find samples in among extant items. (13) kid: leather shoes, not fabric shoes. (14) "fan of white crape": not a paper fan. This would have been crape silk. It's unclear whether the gold is meant to describe the decoration of the crape or of the sticks. The gold could have been in spangles (flat sequins, not cupped sequins), or painted, or possibly gilding (if referring to the sticks). Article number two from the La Belle Assemblée fashion pages. A long feather in front of the hat, and a bow of ribbands with long ends on the left side. These are two articles of fashion generally adopted. At the commencement of this fashion the feather was worn immediately in front of the hat; to-day it may be worn a little on one side. In the first instance it was worn in a straight and upright form; but to-day it is admitted to be a little inclinded; a white bow of riband may likewise be worn, or one of pink, but what is most admired is a mixture of both; that is to say, a ribband composed partly of pink and partly of white; or if you prefer, yellow and white. At first the ends of the bow were placed in an opposite position to the feather; but now it is worn on the same side. Borderings of gold embroidered on bats of black velvet are considered the summit of elegance, but the embroidery must be extremely light; it must form only a narrow border, for the broad would be considered vulgar. Pearl and coral beads are the grand resource of milliners; yes, pearl and coral. We have said that the pearls have taken precedence of bugles. It is not the same with the coral; they have taken precedence of the pearls. The last article from theJanuary La Belle Assemblée fashion pages. Of interest here is that the magazine, which publishes information about happenings among the higher levels of British society, very plainly supports the notion that fashion emanates from the socially privileged and that reporting on fashions coming from any other portion of society isn't necessary, or proper. This statement somehow feels to me like a rearguard action by writers concerned about the rise of a moneyed industrial and bourgeois class...something that was already occurring in Britain. 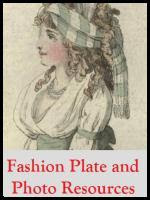 How different from Parisian journals such as Galerie des Modes, which even back in the 1780s had fashion plates which appear to show women of the demi-monde. Our readers are doubtless informed that the mourning for the late Princess Amelia does not expire until the 11th of the present month, and that the Court has extended it three weeks beyond that period, in complement to the deceased Queen of France. As the mourning habit admits but of small variation, we have again but little of novelty to communicate. The few remarks we have to make respect only the form of the dresses, and of those articles that compose them, which are considered as most correspondent to the order issued by the Court. Were we to detail the different dresses worn by numbers of people, we might still fill our pages with the enumeration of varieties, and hold up something of gaiety, though not of splendour; but those who compose the Court, or are connected to it, and are therefore the surest models of fashion, afford us no such source; they still continue to adhere to their sable garments. In morning dresses black sarsnets or lustres (1), either high in the neck with crape ruff (2), or in the pelisse or wrap form, seem most prevailing, buttoned down the front (3). 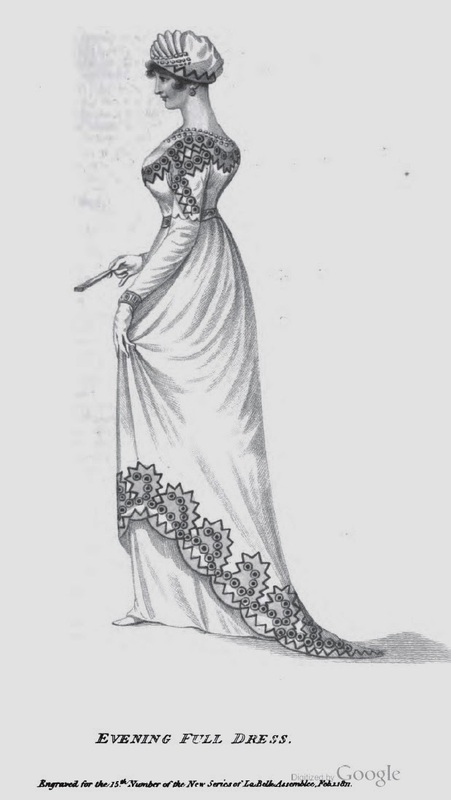 For dinner dressses, the long sleeves of sarsnet give place to those of crape; the bosom is cut down and the neck shaded by a small tippet of white crape or lace; in public, tippets of swansdown are very numerous; on the parade, sable seems most admired, and best adapted to the smoky atmosphere of the metropolis (4). Evening dresses are most elegantly appropriate when made of black crape, and worn over white satin. We have also been compelled to admire those in grey crape, trimmed with white bugles (5); black lace dresses are also very frequent, but they are not mourning. Gold is much worn on the head, either in the form of bands or nets; pearls also, in every device, are very generally worn, and contrast extremely well with the mourning garb. For the promenade, cloaks in scarlet Merino, or grey cloth (6), black velvet pelisses, lined with gray sarsnet, wrapped plain over with sable tippets; Spanish hats (7) in velvet, or cottage bonnets (8) in black, grey, or scarlet cloth, or scarlet. (1) "black sarsnets or lustres": sarsnet is a thin silk, lustre may be another term for "lustring", a thin, papery, rustly silk. Note that the recommendations are silk only for morning dress. No longer are journals recommending mostly muslins, as they did a few years previously. 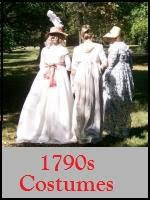 Fashion is moving on from the early Regency preoccupation with the Greek look. (2) "crape ruff": crape is translucent, so this ruff would have let a good bit of skin show. It must have been starched or wired to retain its shape. (3) "wrap form": would like to investigate the potential closure lines of coat-like garments at this date. (4) Tippets, tippets, tippets! The must-have accessory in wintertime. Down and fur for their warmth, lace for its looks. It is too bad few have survived. I am especially looking for lace tippets, in order to understand their cut and length. (5) "white bugles": white bugle beads. Napoleon and the Empire of Fashion features a dress beaded all over with lines of white bugle beads. (6) "cloth": once again, they mean wool. (7) "Spanish hats": looking into this. (8) "cottage bonnets": here is a fashion that would last decades: the little, deep-brimmed bonnet. They are described as being made in wool or, most likely, sarsnet (thin silk), not "scarlet". (9) The jewelry is smaller in scale than years past. This fashion would last for some years, in keeping with the delicate flouncings and small-scale embroideries in dresses then fashionable. I am wondering what effect the Napoleonic Wars had on jewelry; there are probably publications about this. In Europe, at any rate, large amounts of older jewelry were melted to sell. See Napoleon and the Empire of Fashion for more information. See you next month, as we explore February, 1811. Let's see if our investigations bear any fruit. Let's also see what I learn about the journal itself and its readers.